A team of researchers from Rensselaer Polytechnic Institute has created the world’s first material that reflects virtually no light. Reporting in the March issue of Nature Photonics, they describe an optical coating made from the material that enables vastly improved control over the basic properties of light. The research could open the door to much brighter LEDs, more efficient solar cells, and a new class of "smart" light sources that adjust to specific environments, among many other potential applications. A fundamental property called the refractive index governs the amount of light a material reflects, as well as other optical properties such as diffraction, refraction, and the speed of light inside the material. "The refractive index is the most fundamental quantity in optics and photonics. It goes all the way back to Isaac Newton, who called it the ‘optical density,’" said E. Fred Schubert, the Wellfleet Senior Constellation Professor of the Future Chips Constellation at Rensselaer and senior author of the paper. Schubert and his coworkers have created a material with a refractive index of 1.05, which is extremely close to the refractive index of air and the lowest ever reported. Window glass, for comparison, has a refractive index of about 1.45. Scientists have attempted for years to create materials that can eliminate unwanted reflections, which can degrade the performance of various optical components and devices. "We started thinking, there is no viable material available in the refractive index range 1.0-1.4," Schubert said. "If we had such a material, we could do incredible new things in optics and photonics." So the team created one. Using a technique called oblique angle deposition, the researchers deposited silica nanorods at an angle of precisely 45 degrees on top of a thin film of aluminum nitride, which is a semiconducting material used in advanced light-emitting diodes (LEDs). From the side, the films look much like the cross section of a piece of lawn turf with the blades slightly flattened. The technique allows the researchers to strongly reduce or even eliminate reflection at all wavelengths and incoming angles of light, Schubert said. Conventional anti-reflection coatings, although widely used, work only at a single wavelength and when the light source is positioned directly perpendicular to the material. 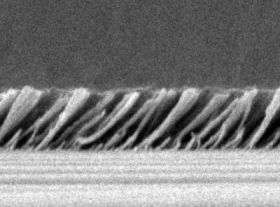 -- More efficient solar cells. The new coating could increase the amount of light reaching the active region of a solar cell by several percent, which could have a major impact on its performance. "Conventional coatings are not appropriate for a broad spectral source like the sun," Schubert said. "The sun emits light in the ultraviolet, infrared, and visible spectral range. To use all the energy provided by the sun, we don’t want any energy reflected by the solar cell surface." -- Brighter LEDs. LEDs are increasingly being used in traffic signals, automotive lighting, and exit signs, because they draw far less electricity and last much longer than conventional fluorescent and incandescent bulbs. But current LEDs are not yet bright enough to replace the standard light bulb. Eliminating reflection could improve the luminance of LEDs, which could accelerate the replacement of conventional light sources by solid-state sources. -- "Smart" lighting. Not only could improved LEDs provide significant energy savings, they also offer the potential for totally new functionalities. Schubert’s new technique allows for vastly improved control of the basic properties of light, which could allow "smart" light sources to adjust to specific environments. Smart light sources offer the potential to alter human circadian rhythms to match changing work schedules, or to allow an automobile to imperceptibly communicate with the car behind it, according to Schubert. -- Optical interconnects. For many computing applications, it would be ideal to communicate using photons, as opposed to the electrons that are found in electrical circuits. This is the basis of the burgeoning field of photonics. The new materials could help achieve greater control over light, helping to sustain the burgeoning photonics revolution, Schubert said. -- High-reflectance mirrors. The idea of anti-reflection coatings also could be turned on its head, according to Schubert. The ability to precisely control a material’s refractive index could be used to make extremely high-reflectance mirrors, which are used in many optical components including telescopes, optoelectronic devices, and sensors. -- Black body radiation. The development could also advance fundamental science. A material that reflects no light is known as an ideal "black body." No such material has been available to scientists, until now. Researchers could use an ideal black body to shed light on quantum mechanics, the much-touted theory from physics that explains the inherent "weirdness" of the atomic realm. Schubert and his coworkers have only made several samples of the new material to prove it can be done, but the oblique angle evaporation technique is already widely used in industry, and the design can be applied to any type of substrate — not just an expensive semiconductor such as aluminum nitride. Schubert is featured in an interview about the research in the same issue of Nature Photonics. Several other Rensselaer researchers also were involved with the project: Professors Shawn-Yu Lin and Jong Kyu Kim; and graduate students J.-Q. Xi, Martin F. Schubert, and Minfeng Chen.